Most of the world’s clothes, including many designer brands, are manufactured in sweatshops. Workers work long hours with poor conditions and for very low wages. Most of the sweatshop workers are women, but extensive use is also made of child labour. It is nothing short of slave labour. the factories have been described as prisons. There is probably no official definition of what a sweatshop is. The US Department of Labor define it as a factory that violates two or more labor laws. These are laws that pertain to things like wages, benefits, working hours and the use of child labor. Whatever the definition, sweatshops have three major characteristics. The workers will work long hours, in unsafe or unhealthy conditions, for very low pay. Companies try to increase their profits by driving down the cost of production. The alternative would be to charge more for their clothes. This would be very problematic as westerners demand low cost clothing.Therefore they look for factories where the workers will get very low wages and where the local humans rights protections and not strong. Most of the sweatshops are found in Asia, Central and South America although they are also found in Eastern Europe e.g. Romania. So basically, the citizens of the advanced industrial countries exploit the workers in developing countries in order to get low cost clothing. The factory owners are put in a difficult position. They have no bargaining power as there is fierce competition in their industry. They are given a “take it or leave it” offer and know that if they can’t produce the clothing at a low enough price, the work will be given to another factory. This leads to low wages and little money spent on improving the health and safety of the workers. The industry is based on a subcontracting system. The retailers themselves place their orders with manufacturers i.e. the brands themselves. The manufacturers use contractors (who might them sub-contract) to get the clothes made. The contractors and subcontractors pay the workers to produce the clothes. Since the retailers and brands don’t employ the factory workers directly, they try to say they are not therefore responsible for the low pay and conditions. This is a cop-out. Often, the contracts are very short-term, with not enough time to produce goods. The contractor will be under pressure and the result is often excessive overtime, low quality products and an increase in workplace accidents. The situation has got worse because of the global economy. Rich and powerful countries negotiate trade deals with developing countries which allow easy trade of goods and service. Unfortunately, the trade deals are unlikely to have regulations that ensure fair pay or conditions to the factory workers. So the clothing companies benefit from the trade with low prices and big profits. The factory workers lose out with low wages and poor working conditions. 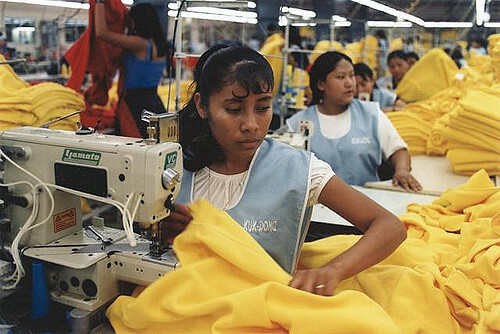 Sweatshops will exist wherever there is an opportunity to exploit workers who are not in a strong enough position to stand up for themselves. The workers are often young and uneducated. Often they are unaware of their legal rights. They are often migrant workers with no bargaining power. Would people pay more for ethically sourced clothes? If a price increase for goods ensured an ethical product, would consumers purchase it? Of course this depends on the circumstances, but according to a Harvard case study on ethically labeled towels, coffee and shirts, the answer is – yes, they would. A study quoted on the doSomething website showed that doubling the salary of sweatshop workers would only increase the consumer cost of an item by 1.8%, while consumers would be willing to pay 15% more to know a product did not come from a sweatshop. When did we stop repairing clothes and shoes ? The problems with unwanted clothes!